Our industry leading hot-melt edge banding machine applies edging tapes with perfect results metre after metre. We have access to thousands of edge tapes from leading manufacturers so are sure to find the perfect match. 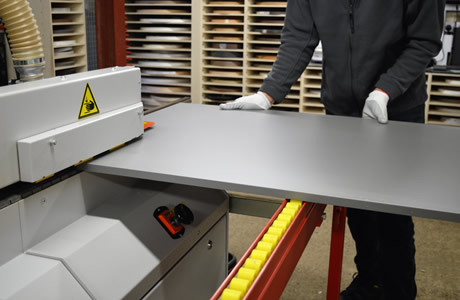 We can edge boards from 10mm to 60mm thick including plywood, chipboard, MDF and more. Colours and wood grains are matched with either 1mm or 2mm edge banding. You can have the option of a square edge or radius on the board. The industrial application of the edge banding ensures an incredibly strong bond to the board which will last for years to come. Our solid wood edging is perfect for our veneer boards and offers a very easy and cost effective option for lipping the board which would traditionally be a labour intensive job. Square edge or radius is available on solid wood edges in 1mm and 2mm. Along with the colours and solid wood tapes we also offer a few ways of preparing MDF end grain for paint. Many of our customers like to select solid wood Maple edging, in a 1mm tape. A second option of edge banding tape is a melamine/paper-based tape at 0.6mm thick. It’s a popular way of sealing end grain on both MDF and MFC. Both options are very cost-effective when compared to the labour of manually sanding end grain.